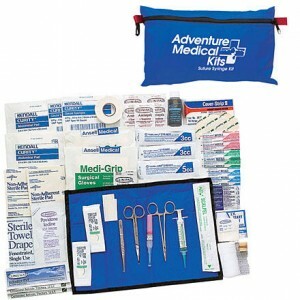 I like the medical kits from Adventure Medical; they contain excellent high quality supplies. Whenever I get the opportunity, I add to my collection. I have purchased their kits, found them in garage sales and have been given them. Recently I came across one of their Suture/Syringe kits. The listed sales price is $80, but you can find them on the internet for less. This entry was posted in medical and tagged first aid, Howard, suture, syringe. Bookmark the permalink. I like the hit, I already have my own but this one is interesting and looks ok. The thing that struck me was the travel comment. There are states you can’t take this in and I can’t even imagine some countries so be careful with the laws.